I try my best to stay away from buying beauty products, especially hair, at grocery stores. But if I do, I buy them from beauty supply stores or salons because they typically have a wider selection of products that aren’t so rich in chemicals (not always). The problem with this strategy is that these products are expensive! But recently, I had quite an epiphany. There are plenty of beauty products I can buy at the grocery store. I’ve just been looking in the wrong section! My new obsession is coconut oil. For me, coconut oil has worked some miracles on my hair, my skin, for my oral health, and for my carpet. It’s so versatile! Plus, it’s cheap. Here are 8 ways you can use coconut oil! 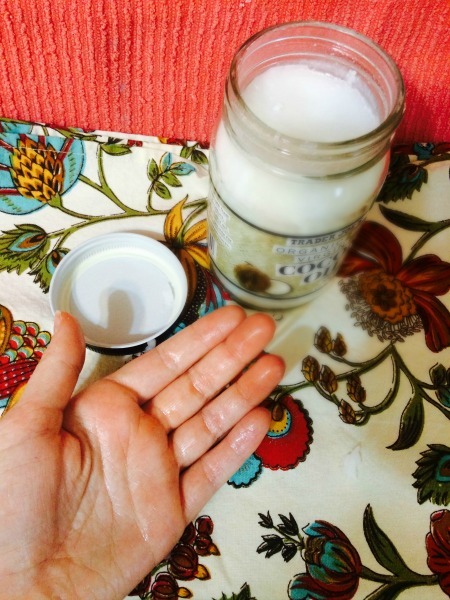 Scoop out some coconut oil in your hands and rub them together. This will help to produce a more liquid consistency. Then, put it ALL OVER your hair (when it’s dry). It will feel gross and greasy, but leave it on for at least 30 minutes. After your time is up, shampoo it out in the shower. It may take a couple of shampoos before you get it out completely. You can leave the oil on for as long as you please. I’ve even slept in it before! I repeat this hair treatment every few weeks to help my hair from getting dry and to help it stay smooth. It works wonders! It is even great for fixing dry scalp. Coconut oil can also be used to tame your waves and curls daily without leaving it looking greasy. Just run a small amount through your hair like you would any oil or mousse. Coconut oil is great this time of year because it great for dry skin. It will bring some relief to chapped lips or little red wind-chapped cheeks. Put a very thin layer on your face in the morning or overnight to leave your skin feeling extremely smooth. It may feel greasy at first, but trust it! Coconut oil is a great replacement for fancy massage oils. Be sure to soften it between your hands before using! Coconut oil pulling is great for oral health. Swish coconut oil in your mouth for about 15 minutes in the morning, and spit and rinse with water. This is called pulling because it “pulls” the bacteria from your mouth. Personally, it is very difficult for me to swish anything in my mouth for that long! So I only practice this occasionally. Mixed with baking soda, coconut oil is great for lifting stains out of your carpet. It is very effective! Lather your legs with this instead of shaving cream to leave them feeling smooth! If you are nursing, try using coconut oil in place of lanolin for soreness. Also, apply it to your baby’s bottom to moisturize and help treat diaper rash. I will say that although it’s considered a “greener” option, coconut oil is not perfect. Some brands come in giant plastic containers and others come in glass jars that can affect taste. Personally, I don’t use coconut oil for taste, so the latter doesn’t apply to me. I buy organic virgin coconut oil from my local Trader Joe’s. Do you use coconut oil in your daily routine? Share your uses! Check out Family Focus Blog’s Eco-friendly Pinterest board for more tips! When my nieces and nephew came out of the CPS system, they were infested with lice! They had 1000s of them! We used coconut oil to kill them! Worked great! Oh wow! I’ve never heard of that. That’s great! I’ve heard that coconut oil is great for hair and I think that I will have to try it! I’ve tried using it for my face but it was a bit too greasy and my skin didn’t react well – now I use almond oil! But I love coconut oil for roasting, it adds the lovely coconut taste to vegetables!